I got this recipe from my step-mom, who got it from her mom. I will probably pass it on to my kids, and hopefully they will pass it on to their kids. When you think about favorite desserts, a few things come to mind – fruits, ice cream, and waffles. But when you think about belgian waffles, you think of warm, decadent, sweet waffles, maybe covered with whipped cream and fresh fruit. This recipe is good enough to last generations. 1. Mix flour, sugar, baking powder, baking soda and salt in medium sized bowl. Make a well in the center. 2. Mix eggs, yogurt, melted butter and milk in another bowl. Pour this mixture into the well in the dry ingredient bowl. Mix everything together. Add more milk if needed. October 9, 2011. Tags: belgian, belgian waffle, belgian waffles, decadent, fresh, fresh fruit, fruit, generation, generations, ice cream, sweet, waffle, waffles, warm, whipped cream. Breakfast. 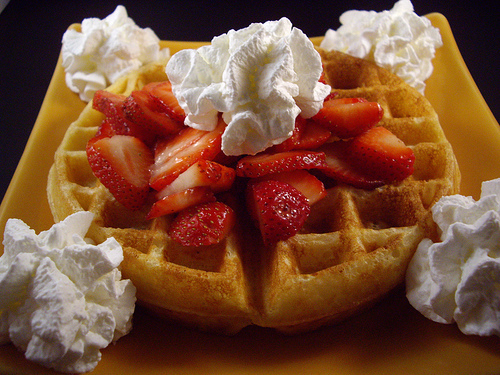 Mmmmm….waffles. I like mine with ice-cream, cinnamon and lots of butterscotch sauce. Mmmm..butterscotch sauce. Thanks for sharing! October 9, 2011 at 7:21 pm. Permalink.